Come to Juurimaa and take part in winter joy! Estonia is covered with a soft snow blanket, forests are under magical, sparkling snow. We offer you relaxing sleigh rides. There is blenty to see and feel. Untouched white snow, covered with the animal steps, interesting to discover for kids and adults. If you are lucky enough you can meet different forest animals: foxes, hares, squirrels, deer and other. 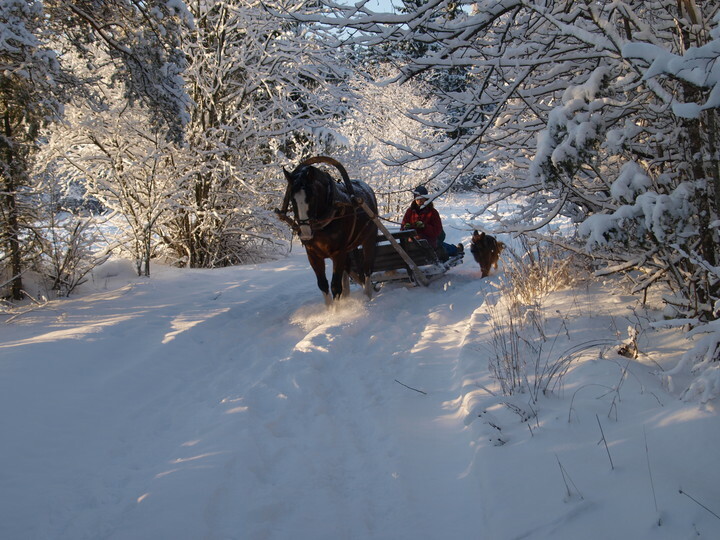 Sleigh ride is a perfect present for you loved ones or for weekend activity. Sleigh ride is a good way to calebrate different holidays for office people, families, friends. Bigger companies can order exciting activities in the stable and in the farm: guided tours, games and fun races. Maximum number of people on sleighs together is 15. Prize for 4 people for 1 hour tour 40 eur, for bigger groups discounts!